If you've ever played Plague Inc., or its inspiration, Pandemic 2, then you've no doubt cursed Madagascar or Greenland for being so difficult to infect. In these games, you take on the role of an evolving disease with a singular goal: the complete annihilation of the human race. You infect, you spread, you mutate, you kill. Mixing elements of strategy and simulation, Plague Inc. became popular enough to attract the attention of the Centers for Disease Control and Prevention (CDC) - the United States' public health institute. In March 2013, creator James Vaughan was invited to the CDC to talk about his game, where he was lauded for raising public awareness "on epidemiology, disease transmission, and diseases/pandemic information." 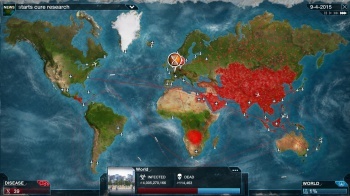 Is the Plague Inc. dev worried about a global Ebola pandemic? With the recent Ebola outbreak raising concerns about the possibility of a global pandemic, it turns out that Plague Inc. goes a long way to laying such concerns to rest. We caught up with James Vaughan to get his opinion. "The current Ebola outbreak is horrific and deeply concerning," Vaughan told The Escapist, "but unless things change significantly, I don't believe we are looking at a full Plague Inc. style situation here." Vaughan pointed out two reasons why he isn't concerned about the outbreak becoming a global pandemic. First, Ebola has no carrier state. "If you are infected, it is very obvious," said Vaughan. "It is not possible to have infected but asymptomatic people spreading the disease." HIV, for instance, has a long period during which a carrier shows no symptoms of the disease, which has helped its propagation. The historically famous case of Mary Mallon - aka Typhoid Mary - is a classic example of an asymptomatic carrier who infected dozens of people without ever becoming "sick" herself. Asymptomatic carriers allow a disease to spread before measures could be taken to quarantine the carrier - it's a sneak attack. The latest estimates I saw suggested it would take two to six months [to bring the outbreak under control]. The second reason Vaughan points to is the fact that Ebola is not an airborne disease. Because it relies primarily on fluid contact to propagate, it is "much easier to prevent the spread of Ebola by adopting the correct precautions and processes." Since quarantine is the best measure to preventing the spread of Ebola, the ability to so clearly identify infected individuals allows for no surprises. Don't touch an infected person - it's that simple. Vaughan explained that the location of the outbreak has resulted in significant cultural and logistical challenges to overcome. For instance, raids on hospitals due to public disbelief in the government's Ebola claims have resulted in quarantine being broken, and the lack of a first-world infrastructure and facilities means some regions have neither the means nor the education to maintain proper sanitation standards. Still, he believes the outbreak can be brought under control. "The latest estimates I saw suggested it would take two to six months," he said.